Which is the best type of solar geyser for you? There are so many solar geyser systems on the market, but are they all just hype? If you’ve been lying near the pool recently (or mowing the lawn), you’ll know that we have an abundance of sunshine in South Africa. Why ignore a free resource when you could be using it to cut costs in your home, dodge load shedding and protect the environment? The cold water from the house is fed through the collector pipes on your roof, and the sun heats it. It then creates a flow of water to and from the tank. As the natural laws of heat and cold apply, the hot water rises to the top of the tank, while the cold water sinks to the bottom. The outlet tap is positioned on the top of the tank ensuring that hot water is always on tap. This circulates the household water in the geyser tank through the solar collector. 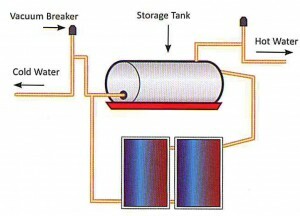 The collected heat is then transferred directly to the household water supply. This eliminates the need for a heat exchanger and the use of heat transfer fluid. It’s relatively inexpensive, as no heat exchange is used. The commission of the solar power system is easier. Anti-freezing systems and/or controls need to be installed when a solar water heater system is used in areas that are prone to freezing. Water softeners need to be added when systems in areas with poor or hard water conditions are used. The solar water heater circulates a transfer fluid, other than water, through the solar collector. 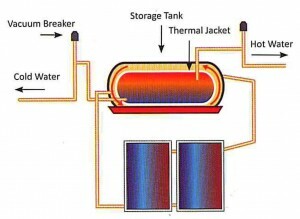 The collected heat is then transferred indirectly to the household water supply using a form of heat exchanger. The lifespan and quality of these systems are far superior to the direct systems and are highly recommended by Solterra Cape/West Coast. Very popular in climates that are prone to freezing. By far the best return on investment system. Solar water heater system can be used in areas with hard or poor water conditions. Tends to be more expensive than a direct solar power system because of the required heat exchanger. The commissioning of the solar power system is more complicated. The heat transfer fluid needs to be replaced every few years (depending on manufacturer’s requirements). 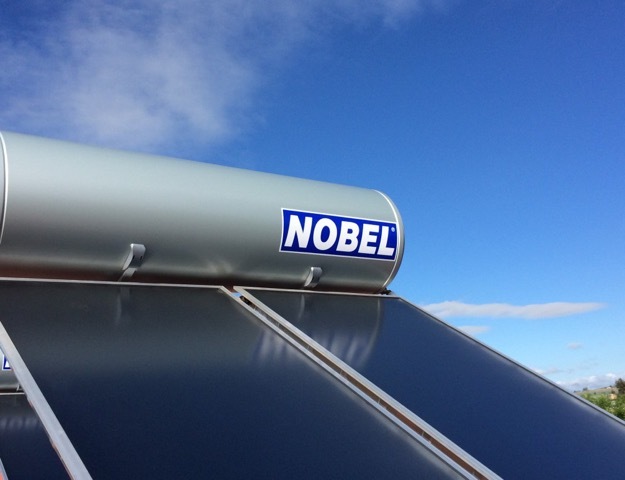 This system can be installed on any roof type and no pump is needed, as long as the geyser tank is higher than the solar panel. The system makes use of a process called Thermo Siphon to move the liquid between the tank and panel. Thermo Siphon is the effect created when hot water rises out of the panel and pushes the colder liquid in the geyser into the panel. For this system the solar panel is on the roof and the geyser is inside the roof. Small solar powered pumps are used to circulate the water or glycol mix around the system. It cannot be installed on flat roofs and there must be access to service the geyser. You always have hot water when there are electricity cuts/shortages. You will get an immediate reduction in monthly electricity bill of 30% – 50% (as per Eskom statistics). If for example your electricity bill is R2 000 a month, then every month you are likely to save R800, and R65 000 after 5 years! You will get immediate protection from future price hikes, as your geyser is the biggest consumer of energy, your solar geyser will eliminate this. A solar geyser system increases the value of your property. You can reduce your risk of future penalties for exceeding prescribed consumption by using solar geysers and the less energy you consume, the less your energy tariff. You are helping to conserve the environment – 3.7 tonnes of carbon gases a year! Upfront investment and installation costs are the biggest disadvantage of solar geysers, but because it saves you money in the long run, it eventually pays for itself. While routine maintenance is needed, only the valves, not the system itself requires it. This is important to ensure the longevity of your system. A Solterra Cape/West Coast system is guaranteed for 20 years when our maintenance plan is adhered to. There is a misconception that solar technology can’t work when the sun isn’t shining, but although heat output is reduced on overcast days, they can still provide substantial heating. SPECIAL OFFER ON SOLAR GEYSERS FOR OCTOBER 2016! Solterra Cape/West Coast has just landed a container of our imported NOBEL Tier 1 highest quality Solar 200 l & 300l Solar Geyser System in Cape Town. These quality systems come with a 10-year warranty period with a 20-year extended warranty option if maintained by our company on an annual basis. These systems give the highest return on investment of any solar geyser in the market in South Africa today.